With all the good weather we’ve been having lately it’s looking like a great season for beekeepers. Many are expecting a hefty honey harvest from their hive…so why not prepare early? 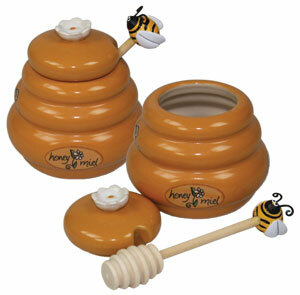 This week you can buy our delightful Honey Pot and Dipper for just £5.00! Usual price £8.15, saving you 38%. This offers a practical and pretty way of storing some of your bees lovely honey for having on your breakfast toast! It will look bee-rilliant on your table, and it’s ideal if you’ve got guests! Click here to buy yours while stocks last!